The activists and communities in Prey Lang rely on the forest to support their livelihoods and fear that continued encroachment on the woodland will further deplete their income. A group of activists working to protect Prey Lang, one of the last remaining lowland evergreen woodlands in Southeast Asia, is hoping that new funding can help avert the constant threat of illegal loggers and poachers. Phai Bunleang, 56, a Prey Lang Community Network (PLCN) activist in Kratie province, says he hopes more money can be sought from the government and non-governmental groups. “Smugglers always get money immediately after they cut down a tree. But we farmers work hard [to protect the forest] and we don’t even have enough to feed the family,” he said. Activists from three other provinces bordering Prey Lang share the same experience and concerns. Anti-logging efforts by the PLCN are largely self-funded. Phouk Bunhong, 44, a PLCN activist in Preah Vihear province, said she was upset that funders continued to overlook the group. According to PLCN, about 250,000 people live in the Prey Lang region. They estimate the forest is home to about 500 animal and plant species. About 11,000 hectares of forest was clear-cut in 2016 and more than 2,000 illegal logging cases reported. Last week, USAID partnered with the environment ministry to launch the “Sustainable and Effective Management of Prey Lang Extended Landscape” program. 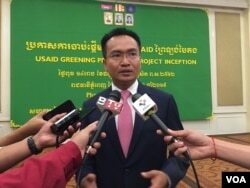 Matthew Edwardsen, USAID Green Prey Lang chief party, said a solution must be found before it was too late. USAID Green Prey Lang is a five-year project that works to promote resilient, low-emission development and inclusive sustainable management through a focus on communities, conservation and improved governance in priority protected areas that include Prey Lang, Preah Roka, and Chhaeb, according to the group. Sao Sopheap, secretary of state of Ministry of Environment, said he hoped the project would improve the lives of community members. “I hope that this project will continue to cut down offenses in the protected area, especially Prey Lang,” he said.